i really like the way it looks flat like this. i am less in love with it when it is adorning my actual body. granted, this is hardly the world’s greatest photograph. for one thing, it is proof for all the internet to see that i permit ramona to rearrange the furniture all day everyday. i just put everything back where it belongs after she goes to bed. anyway, details: the pattern is from the essential A-line book. 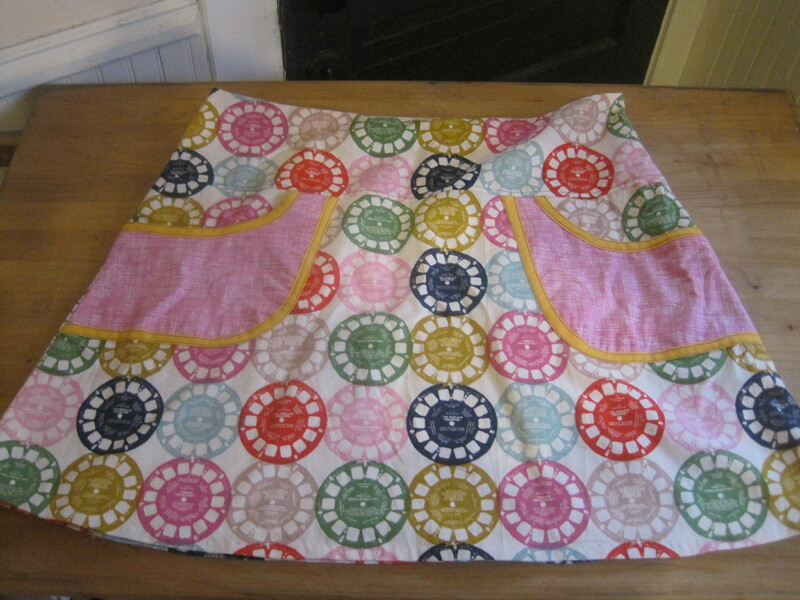 the fabric is from melody miller’s “playful” line by cotton + steel. i am obsessed with it. 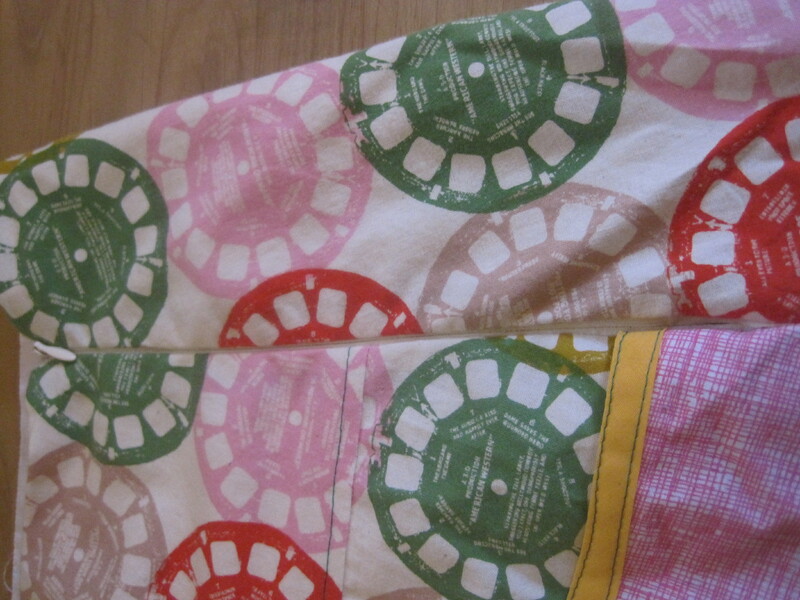 the pockets are some random fabric i got in a quilting stash box. the inside pocket is some navy blue polka dot fabric from the same stash box. i had a fat eighth of each, which was exactly enough for two pockets. the navy looks really great with the viewfinder fabric, which is funny, because i don’t love navy. even funnier: i have two dominantly navy prints set aside to make dresses. how did that happen? LOVE this invisible zipper installation. it’s not quite perfect, but it’s as close to perfect as i have ever managed. i hand-basted it in place first, which obviously helped a lot. i also managed to install it properly the first time. sometimes i really nail it with my zippers, & sometimes i need a dozen tries to get it right. you just never know. obviously i made zero effort to do any print-matching along the side seams. 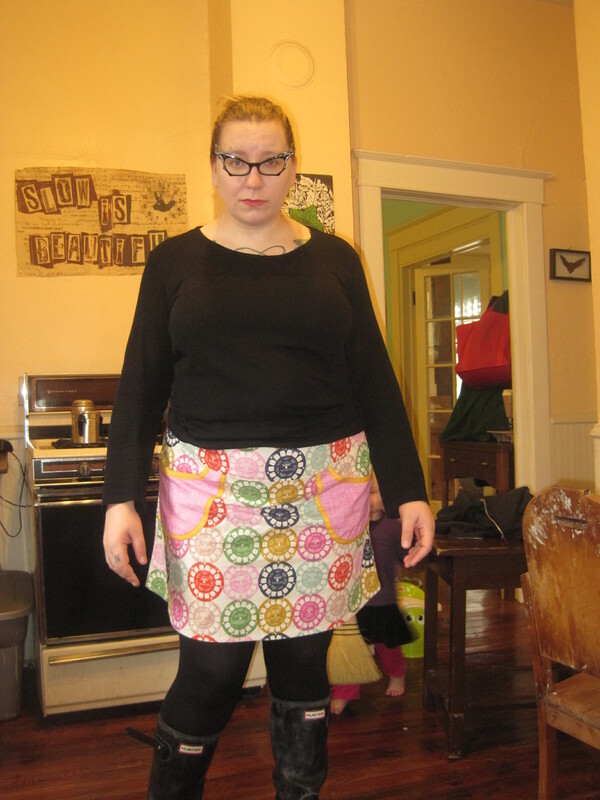 i did kind of try to print match where the yoke meets the skirt front, with meh results. oh well. 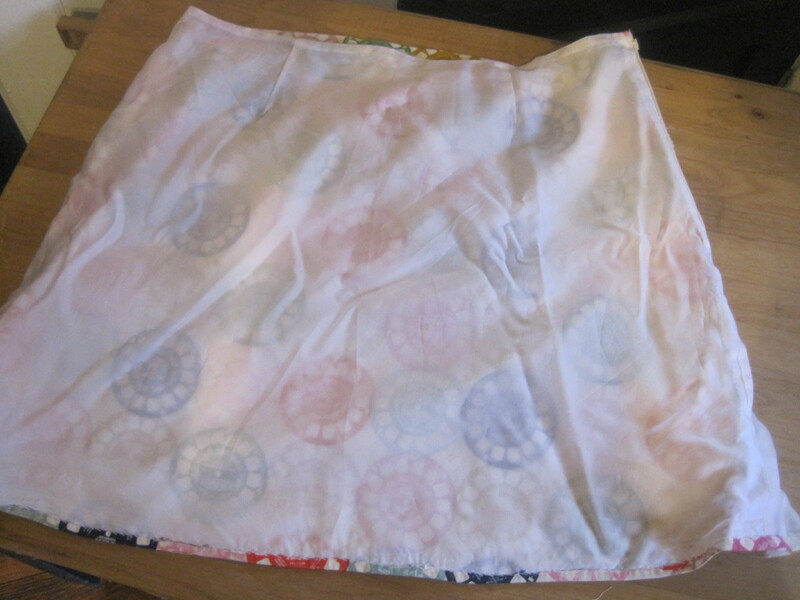 i lined the skirt with bemberg rayon. if you’ve worked with it yourself, you know this is about as well-pressed as it gets. 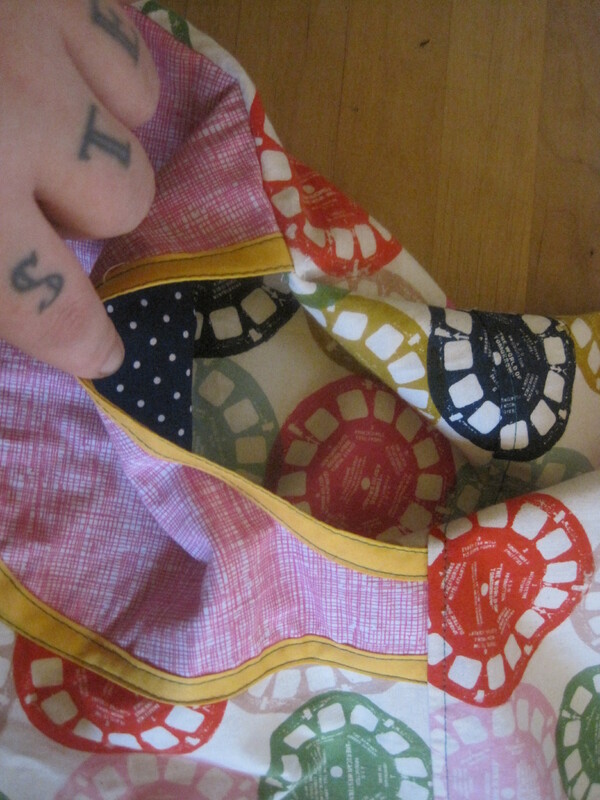 i tucked the lining into the seam allowance & hand-stitched a blind hem. & this is where it all went to hell. i don’t totally understand what the issue was. i did end up having to let out a side seam on the skirt (before hemming) because the finished product was a little too snug. this was upsetting because i have sewn this pattern at least a dozen times, & was actually working off a traced pattern altered to fit my exact measurements. maybe i’ve gained a little weight since i did those alterations? i also finished the seam allowances on my serger before i started sewing. i tried to be careful not to cut off too much skirt material, but i did cut a little. but it was seriously like 1/8″ total, & the skirt was tighter than that. also, because it was too tight (i mean, i could get it on & zipped & everything–i just didn’t love the fit), it also pulled upwards & was a little too short. it was the perfect length…unhemmed. i did as tiny a hem as i possibly could, but it’s still shorter than i want. & i let out the side seam without the zipper installation as much as i could but it’s still just a hair too tight. also, the lining was kind of uneven, & despite all my efforts at pressing, pinning, trying the skirt on, re-pressing, re-pinning, hand-basting, lather, rinse, repeat, the lining pulls on the hem in a weird way in the back. i think ultimately it’s an issue of the skirt being a tiny bit too small, so when i pull it down in the back, the lining rides up because it’s slippery bemberg & that pulls on the hem & it starts to billow out & look wonkus. i seriously stitched & re-stitched that thing like five times trying to fix it (by hand!). it seems to be unfixable. unless i take out the entire hem, cut the lining to be an inch or two shorter than the skirt, & hem them separately. which is what the pattern calls for, actually, but i wanted to get all fancy with it. i don’t know. i wore the skirt to the library this morning for story time & it was okay-ish. i kept feeling self-conscious about thinking it was too short or riding up in the back, but i don’t know that it was. i’m thinking about making a ruffle out of some green netting i’ve got in my stash & adding that to the bottom for a little more length. i might just be out of practice wearing skirts because i’ve been wearing jeans all winter. if i have gained a little weight, i wonder if maybe i’m feeling iffy because i’m not feeling like the skirt shape flatters me like it could? maybe i should try a more fuller silhouette? maybe a gored skirt with a waistband? i like A-lines because i don’t have to worry about them blowing up in a strong breeze, but…*shrug*. not sure what’s next on the sewing agenda. i would like to tackle mccall’s 6696, which has been languishing in my pattern stash for like eight months, minimum, but i might do something smaller first. this hem situation really wore me down, man. on the plus side, i picked up my new butcher block/cutting table yesterday! we actually had to carry it home because it wouldn’t fit in our car. jared wore ramona in the ergo & off we went. thankfully, we only live a block & a half away from the antiques mall. i’m really looking forward to cutting my first sewing project on a table of appropriate height! ETA: over the course of wearing the skirt for a few hours today, it is stretching a bit & fitting much better & the lining is laying better. yay! maybe it’s not a total fail after all! I think the skirt looks great! I hate worrying that my skirt is too short (it’s one of those things that I will get into my head and not be able to let go), but I think that the length works fine. Maybe whip up a pair of leggings to go underneath? I would never wear leggings as pants, but I am perfectly fine with wearing them to feel more confident in a shorter skirt. well, i was wearing them with fleecy opaque tights (thicker than some leggings) & i still felt weird. i haven’t worn the skirt again because i’m always sick when it’s warm enough for skirts, but i feel like i do need to do something about the length & wonkus hem if i’m going to get any use out of the skirt at all. i’m also looking around for other skirt patterns i can try.